Lose weight, the healthy NaturHouse way! Being a food blogger, I would be caught lying if I don't admit that I too have problems with controlling my weight. With all the food tasting events I willingly and happily attend on top of the usual flavorful, sinful dishes I eat on a daily basis, it would be impossible not to pack on the unwanted pounds. Actually, in this day and age where a fast-paced, modern and internet-dependent, yet sedentary lifestyle is the norm, you can call yourself one of the lucky (or really hard-working) ones if you don't already sport a ballooning waistline. And unfortunately, weight loss doesn't come in a one-size-fits-all dress. Some people turn heavily to all kinds of slimming products and fad diets to no success, while many still have the "to start working out" on their must-do-but-never-have-done list. There are even some who try their hardest to squeeze in some exercise time on top of trying to eat more healthily, yet would still find themselves hitting a plateau on their weight loss goals. And while you might not share this same belief, for me personally, the key is not really "to lose weight" but "to eat and live healthier" with an added bonus of losing weight. Fortunately, there are also others who believe in that same principle, including NaturHouse, a Spanish dietetics firm which is located at the lower ground floor of SM City North Edsa. 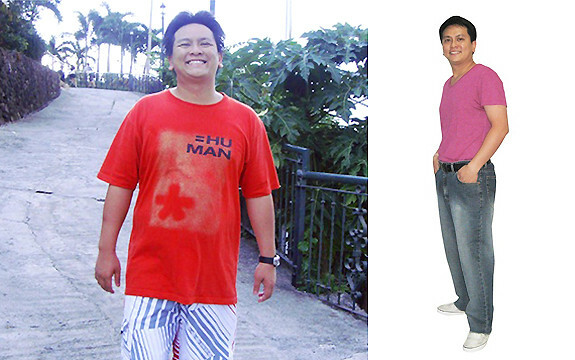 And to give you an idea how NaturHouse can help you with your health and weight loss goals, Ethan Manzano, a 29-year old certified public accountant and audit manager shared with us his weight-loss journey and success story. Ethan recalled that back when he was still in college and still had time to play basketball and engage in other physical activities, he had a fit body. But upon being part of the workforce, he noticed that his metabolism slowed down and finding time to do sports is close to impossible with his busy schedule. To add to that, the more stressful environment also proved to be the reason why he turned to eating as a way to cope with stress. Now, don't we all relate to Ethan in one way or more? With the aid of NaturHouse's nutritionists and food supplements, Ethan was introduced to a healthier lifestyle and successfully lost the unwanted weight. From 205 lbs., he reached his ideal weight of 175 lbs. which is proportional to his height of 5'8". Every person is different, thus NaturHouse creates a personalized weight loss program for each of its clients. For Ethan, he was instructed to engage in physical activities like brisk walking and jogging and to strictly follow a diet regimen which was changed every week, depending on the results of his body to the diet. For the first week, he only ate fruits, vegetables, cereals, white meat and drank two liters of water every day. With a lighter diet, exercise and the help of food supplements from NaturHouse, Ethan lost an astounding 5 pounds in just one week. On his second week, diet was almost the same and he was given a new set of supplements. On his third week, he was allowed to eat fish, pork and beef with less oil and half a cup of rice during lunch. On his fourth week, he was finally allowed to eat anything and everything, albeit in moderation. On the last day after he was allowed to eat anything, he was asked to take a crash diet, eating three mangoes or a big watermelon for a day. And the following week, his diet was back to normal where he could eat anything in moderation with the right food supplements from NaturHouse. Located at SM North EDSA in Quezon City, NaturHouse provides the client with the assistance of a licensed dietitian and nutritionist inside the store. This is what makes NaturHouse unique from the other weight-loss centers. It's not only a food store but also provides a personalized service based on the clients’ body weight or structure as the in-house nutritionists at NaturHouse will create personalized diet plans and recommend food supplements based on the assessment. Normally, a nutritionist at a medical center who will provide you with a diet plan can cost around P1,500. And that’s for a trial program only. At NaturHouse, consulting a nutritionist is free of charge. "It is expensive to consult a nutritionist, but now it can be achieved. During the cost of the method or program system, say the problem is four kilos overweight, we guarantee 0.6 to one kilo weight loss. So another two months for stabilization, that would cost roughly P1,125 per week. That is still cheap as compared to other slimming programs. Here, you just spend 15 minutes per week to a nutritionist who will recommend you the right products," says Rick Cabanban, Natur House Philippines Project Leader. Filipinos have already become health-conscious. However, we still don’t know the right food supplements to be considered. "Most of us have the tendency to self-medicate. Sometimes we starve ourselves and when we don’t see the results, we get frustrated. In NaturHouse, the nutritionist calls the client to check. If there’s any problem, we restructure everything," Cabanban says. NaturHouse also encourages its clients to eat five meals a day. "During maintenance period, the client goes back to regular eating. By that time, the clients’ body has already gotten used to eating in small portions and everything in moderation." Cabanban shares. A global health brand with more than 2,000 outlets worldwide and over four million clients, NaturHouse has finally reached the Philippines, the foreign company’s first venture in Asia, with plans to open 140 stores nationwide, either company or franchised-owned. One of the best-selling products at NaturHouse is the Garcinia Cambogia from the highest quality plants in Asia which contains an extract called Hydroxcitric Acid (HCA) that blocks fat development by inhibiting the enzyme ATP citrate lyase from converting carbohydrates into fat. When we eat too much carbs and sugars, the body just puts these away as fat. The fat-making process is halted by the HCA in Garcinia Cambogia. "Cholesterol is a result of having too much sugar and fat in one’s diet," said Cabanban. "Our price range is comparable with other food supplements in the market. We have the same objective but to get a free nutritionist is an added feature. NaturHouse does not require any franchise fee when you want to open a business selling our products. Our advocacy is healthy eating and to provide jobs for nutritionists," adds Cabanban. For more information, visit NaturHouse Philippines' Facebook Page. Want a homebase job? Work part time of full time. I will visit them also next week for free consultation with their nutritionist. Thanks for sharing this, I really want to lose weight cos after giving birth 3 years ago I'm having a hard time in losing weight so I got to try this. Thank you for sharing this one, i actually planning to have my executive check up this year, para malaman ko kung anu ung mga basic routines na pwede sakin. I have tried different slimming products just to get back my weight before, without even asking to an expert. I never heard this Naturhaus before, but I am interested to try this one. Thanks for this informative article. yay,good thing i read about this,i can now have he chance to loose weight! wohoooww.... I want to try slimming products. After giving birth It gives me hard time to loose weight. This maybe a time for me. Hey, Wow all the posts are very informative for the people who visit this site. Good work! We also have a Blog/site by name Simply herbal which covers Health related products. Please feel free to visit our site. Thank you for sharing. Smoking makes an adverse impact on your health and your Timur Fedorov insurance policy as well. An insurance company will charge you a higher premium in proportion to the risk associated in providing a health cover. An important point to note that you should disclose all relevant information regarding your health and smoking habits. In case, you are found hiding or providing fake information, the insurance company may decline in settling the claims. Fitness training helps Improve health and well being. Most people live very busy lives while working at jobs or doing chores at home. In hectic living situations it is easy to put off or to undertake any form of online fitness exercises and fit these into a busy schedule. However, fitness should be an activity of importance, and enough time should be set aside, on a regular basis, for fitness training weight loss and better health. When somebody mentions building body the first thing that might be going across your mind could be that body building is a tough YK11 Sculpting body requires hours and hours of sloughing out in the gym and a rigid diet and taking harmful supplements. Well the fact is that building body is the easiest thing to do if you get the proper guidance. This article is to help you get a good quality Manuka honey and not be fooled by alternatives that are not quite good. Follow the guidelines and the rest of the facts mentioned here and you should not have any problems a good manuka face products. Weight gain is common in pregnancy and that is Website too, but that gain should be regulated and monitored specially for those who were overweight or obese. Read this article to find effective ways to avoid excess pregnancy weight gain.